The cartoon shows an elderly Palestinian woman with a Palestinian flag on her shirt speaking to British Prime Minister Theresa May. 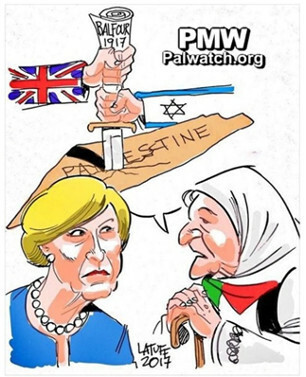 In the elderly woman’s speech bubble two hands are seen – one with the UK flag and the other the Israeli flag on their sleeves – stabbing a knife into the PA map of “Palestine” that presents all of Israel as “Palestine” together with the PA areas. The map is labeled “Palestine.” The handle of the knife consists of a document, on which “Balfour 1917” is written.